Chlorophyll is a molecule produced by plants, algae and cyanobacteria which aids in the conversion of light energy into chemical bonds. Chlorophyll is known as a pigment, or molecule that reflects some wavelengths of light, while absorbing others. Pigments produce a variety of colors in the plant and animal world. Chlorophyll is a green pigment, and is responsible for the green color of plants and algae. In plants, there are two specific forms of chlorophyll: chlorophyll a and chlorophyll b. Each form of chlorophyll absorbs slightly different wavelengths of light. As seen in the graph below, chlorophyll a absorbs dark blue wavelengths and dark red wavelengths. Chlorophyll b absorbs a light blue wavelength and a reddish-orange wavelength. Plants have both forms of chlorophyll, which allows them to absorb most blue wavelengths and most red wavelengths. The large dip in the middle of the graph near the green wavelengths is due to chlorophyll reflecting, instead of absorbing, green light. Plants use both forms of chlorophyll to collect the energy from light. Chlorophyll is concentrated in the thylakoid membranes of chloroplasts. Chloroplasts are the organelles in which photosynthesis takes place. The thylakoids are small sacs of membrane, stacked on top of each other. Embedded in these membranes are a variety of proteins that surround chlorophyll. These proteins work together to transfer the energy from light, through chlorophyll, and into the bonds of ATP – the energy transferring molecule of cells. ATP can then be used in the Calvin cycle, or dark cycle, to create sugars. The series of proteins that transfer energy from light and channel it into the synthesis of sugars are known as photosystems. The entire process, both light and dark cycles together, is known as photosynthesis, and occurs in plants, algae, and some bacteria. These organisms take in carbon dioxide (CO2), water (H2O) and sunlight to produce glucose. They can use this glucose in the process of cellular respiration to create ATP, or they can combine the glucose into more complex molecules to be stored. A by-product of photosynthesis is oxygen. Plants can use this oxygen in cellular respiration, but they also release excess oxygen into the air. This oxygen allows many non-plants to undergo respiration as well, thereby supporting life on Earth. The oxygen is produced in the first part of the light cycle of photosynthesis. Plants split water molecules to produce electrons, hydrogen ions, and diatomic oxygen (O2). The electrons supply the electron transport chain that drives ATP production. The oxygen is released into the air. In this way, all the oxygen we breathe is produced. Because of chlorophyll, all life on Earth is possible. The first benefit of chlorophyll is sugar, produced through the process of ATP which is driven by chlorophyll. Plants, as primary producers, produce the basis of the food chain. All other organisms in the food chain rely on the sugars plants create to sustain life. While the top predators in a food chain may never eat a single plant, they most certainly eat herbivores. These herbivores only eat plants, and grow and create muscle by digesting and utilizing plant nutrients. The accumulation of these nutrients in nature would not be possible without chlorophyll. The second benefit realized by all organisms is oxygen. While chlorophyll does not produce oxygen directly, chlorophyll and the complex of proteins it is associated with transfer electrons to molecules like ATP and NADPH, which can hold energy in bonds. The need for electrons to drive this process causes water molecules to be split, creating oxygen. This oxygen is released into the atmosphere. Plants, algae, and cyanobacteria, produce all of the oxygen in the atmosphere. All other animals, and most plants, need this oxygen to survive. Photosystem – The series of proteins and pigments that transfer energy to coenzymes such as NADPH and ATP, which provide the energy for many cellular reactions. Pigment – Molecules which reflect some wavelengths of light, while absorbing others. Thylakoid – The series of membranous sacs present in chloroplasts which hold the photosystems and other proteins involved in the light-reactions. Chloroplast – The organelles responsible for photosynthesis. 1. Scientist from NASA are trying to grow vegetables in space. They have lights to grow the vegetables that come in different wave lengths. Which wavelengths of light should be used to grow vegetables? A is correct. To answer this question, refer to the first picture in the article. The absorbance, or amount of light that each wavelength absorbs is shown by the different colored lines. A high absorbance means the pigment can transfer energy from that wavelength. 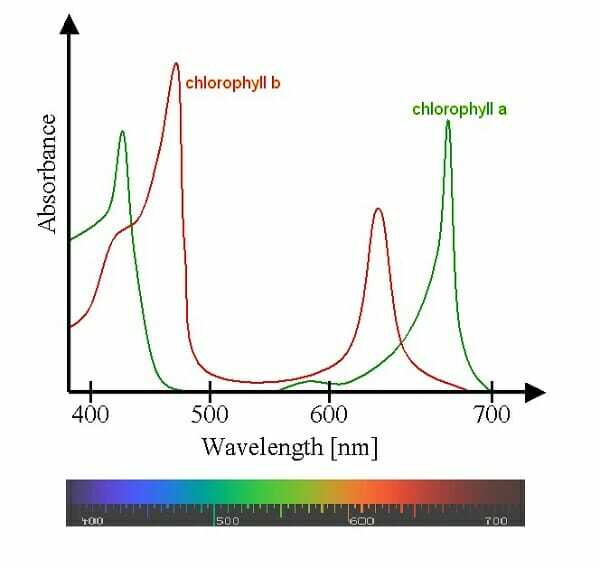 The 500-600 nm area has a very low absorbance, and the 700-800 nm wavelength is above the range chlorophyll reacts to. Therefore, the 400-500 nm range has the highest absorbance. The vegetables, in this range, would be able to use the energy supplied by the lights. 2. Clouds in the atmosphere can filter certain wavelengths of light. On sunny days, more red light makes it to the surface of Earth. On cloudy days, more blue light. Why is it important for plants to have both chlorophyll a and chlorophyll b? A. Both are needed to work together to produce sugar. B. On certain days, different wavelengths can provide energy. C. Plants contain both by accident. B is correct. The variable amount of light present on the surface of the Earth requires that plants have pigments that can work with different qualities of light. If plants only had one or the other versions of chlorophyll, they would not be able to function on certain days, and would die. Both versions of chlorophyll allow them to exploit a variety of environments and conditions. 3. Plants contain other pigments besides chlorophyll, two of which are xanthophyll and carotene. These pigments do not reflect green, but red and yellow. In plants that lose their leaves in the fall, the leaves turn from green to red, yellow and brown in the fall. If xanthophyll and carotene are present the whole time, why are the leaves only red and yellow in the fall? A. Chlorophyll is dissolved in the fall, leaving only the red and yellow pigments. B. Cold temperatures allow the red and yellow pigments to reflect light. C. The sunlight changes in the fall, revealing the red and yellow colors. A is correct. With the decreasing amount of light in the fall months, plants begin to stop making chlorophyll as they become dormant for the winter. Like all molecules, the chlorophyll begins to dissolve after a time. Xanthophyll and carotene take longer to dissolve, and are left in the leaf long after all the chlorophyll is gone. Although chlorophyll normally overpowers the red and yellow, without it only these colors can be seen.